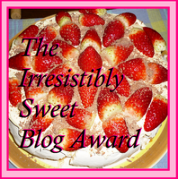 Well, the lovely and talented Laura Kaye was nice enough to nominate me for the Irresistibly Sweet Blog Award. Thank you, Laura, for thinking of me. For those of you who aren't familiar with Laura Kaye, she recently released the book Forever Freed ,which I personally can't wait to get my hands on. To find out a little more about this book and author, go to her website and/or her blog . What an awesome award to come my way since my current WIP, Who's the Cake Boss is all about delicious desserts in the form of cakes, and of course, I have a notorious sweet tooth. 1. Thank and Link To the Person who Nominated You (Done and done.) Much love your way Laura Kaye. 1. I'm the oldest of six children. 2. I'm an Aquarius, so I am always the odd-bird (er...duck...water sign and all). 3. I hate to drive and would gladly hire a chauffeur if I had the money. 4. I spend way too much time watching reality TV (serious guilty pleasure). 5. I have the uncanny ability to not worry about things that are out of my control (it's a blessing and a curse). 6. My role model growing up was Cher, mostly because of her independence, not necessarily because of the boy toys, although that was an added perk. 7. My I-pod playlist is so random, people would surely think I have a dissociative identity disorder (it used to be called multiple personalities, and I don't). 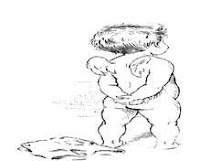 So, there you go--seven very random facts about me. Thank you again, Laura, and I wish you much success with your release. Had to smile~ I'm an Aquarius as well. We're a lot of fun!